For believers in Christ who walk their faith, there is no need for Connecting the Dots … with The RESPECT PRINCIPLE because “There is neither Jew nor Greek, there is neither bond nor fee, there is neither male or female: for ye are all one in Jesus Christ” (Galatians 4:29). The challenge for many of us believers though is we often struggle to walk the message of God and Christ in our daily lives because of old patterns, ways of thinking, disbelieving, etc. I know I do as someone who recently reclaimed my faith in God, Jesus and the Holy Spirit. I also know God re-entered my life through the door of my scientific-driven mind. He helped me to connect the dots intellectually with the idea of respect as a non-biased, non-prejudicial, non-religious, yet logical, practical plus compassionate tool and guide. Ironically, as he gave me this tool and guide to share with our scientific-driven world, yet during the process my own RESPECT LEVEL was raised, and continues to rise, in order for me to connect with my own spirituality … my personal connection to God, Jesus and the Holy Spirit. For me, the Bible is no longer a collection of stories about rules and punishment for failing, but about believing this world is a world of experience … and that when done in partnership with God is not lonely and depressing, but filled with relief, knowing that no matter what, we are never alone, and as we turn back to God for everything and do our part, so does he. My life is nowhere near the vision he put in my heart years ago, but I am learning and learning to believe, that what he started in my heart, he will finish. In the meantime, my life does not yet appear to be a witness to all that God promises, but when I, others and God is ready, he will demonstrate through me what happens when one believes … and waits patiently for him to show a great victory. Remind yourself as I do, as God tells me to, think about Abraham and Sarah, David and Goliath, Daniel and the lions … Jesus and the Resurrection … remember with God anything really is possible. In the meantime, there are many times I don’t love, or even treat others or myself Respect “fully” because I am still learning how … nonetheless, I have come a long way from where I’ve been … which is all he asks of me or you. Christian or not, we do not know someone’s life story, what is in their heart, what has been done to them to make them act as they do … nor is it our right to judge and condemn … that is God’s only. As for us, we are all one in his eyes and what we do to others we do to ourselves … we are all connected, whether you consider the scientific knowledge we all have to live on this planet together or whether you accept God’s message of do unto others as you would have them do unto you. Either way, connecting the dots with respect or love, simply means, it is in our own best interest to strive ardently towards learning how to live and work together harmoniously … to use either, or both, The RESPECT PRINCIPLE tool and guide … or love. Anything less is self-annihilation, Christian or not. Galatians: 5:14 Thy shalt love thy neighbour as thyself. TRANSPARENT LEADERSHIP … Is it Possible? In a world driven by the subversive Disrespect Philosophy hiding our conditioned negative thoughts and actions is necessary, not only to protect ourselves from others but also from ourselves … because we know, deep in our hardening hearts, such thoughts and actions are not right. Therefore, the idea of transparency, feels unrealistic and unachievable to many of us, because in a world driven by the assumption we are all unworthy of respect for just being a life, who, in their right mind, would not want to hide part of themselves from the world as we know it … because we afraid of how we will be judged … and crucified. Yet ironically, who you are does not matter, because once you are caught not being transparent, you are crucified … not for the lack of transparency, but for getting caught … for bringing out into the light what we know resides in the darkness in our lives, covered by the cloak of the Disrespect Philosophy. Stephen Harper and his team will be feeling their crucifixion this morning as their low RESPECT/VALUE LEVEL for taxpayers money enabled them to justify their actions cloaked in the darkness of the Disrespect Philosophy, but will not serve them well now that their actions demonstrating what they think of taxpayers money has been brought to light. A lack of transparency tells the tale there is stuff we want to hide from you … often under the guise of “You would not understand.” Yet, The RESPECT PRINCIPLE recognizes keeping people uneducated so they do not understand costs us, not only in the money and resources stolen and misused by those who believe they are more valuable than others, but costs us the ability to nurture, develop and encourage individuals and groups to become the transparent role models we need as leaders. Transparent leadership does not mean there will be no mistakes or discord, but that those leading, and those they lead, will be RESPECT “full” enough to let people move beyond what has always been done into the undiscovered realm of what may be possible, so we, as individuals, groups, communities, and nations can move beyond repeating our history of living under the limitations and darkness of the Disrespect Philosophy that enables the people entrusted to serve their community to devalue people and their money collected through tax contributions to serve their own needs and into the transparent light of The RESPECT PRINCIPLE. To quote one of our most loved personalities and brilliant minds, Albert Einstein, “To keep doing the same thing over and over again is insanity.” From this wise perspective, to keep living under the subversive, often sub-conscious limiting, negative mindset of the Disrespect Philosophy is insane … yet now, not only now do we have the awareness of what needs to change, by Connecting the Dots … with The RESPECT PRINCIPLE, we also have the powerful guide and tool to generate the changes needed for liberating us from hiding in the darkness to walking boldly in the light. Twenty years of research and study, supported by an even longer time of experience and observation, culminated in my body of work, Connecting the Dots … with The RESPECT PRINCIPLE and for the rest of my life, it will always be my work, regardless of what other work I do. I am grateful to serve in whatever ways I can. Growing in spirituality means letting go of science as the religion: the new religion many believe have replaced the Old Biblical Covenant. Discarding the Old Covenant’s legalistic teachings is not easy because they are often taught, experienced and hardwired at a young age. Breeding feelings of shame, unworthiness, guilt and a host of other debilitating thoughts, old Covenant religious teachings, upon analysis, reveal themselves to be limiting and harmful to the point of even creating a sense of hopelessness of never being good enough. As a result, to alleviate depression, oppression and feelings of despair, many people turned to science as the new religion, but science is limited. It is the study of cause and effect, measuring and judging results, including the results of others. We have come to equate bad results with bad people and good results with good people, but as science keeps discovering, we are far from simple beings and what we see is not all there is. Our literal world including our physiology is only a part of what we are as we realize from the creation of artificial intelligence. We are not just a collection of parts like robots, we are our bodies and minds, we are hearts, souls and spirits … and science alone does not, nor will it ever satisfy us spiritually. The RESPECT PRINCIPLE was born to fill the gap, to act as a bridge between science as our religion and our spirituality. Is is a stepping stone, a foundation even to help our transition from our logical and practical scientific approach to our spiritual one by the addition of the emotional and psychological component … compassion. 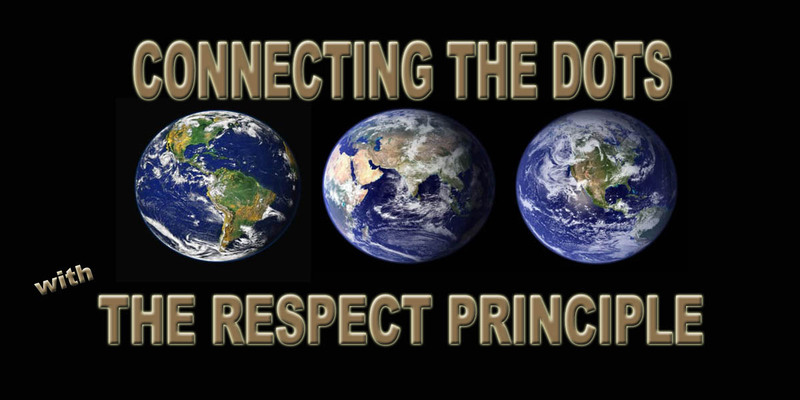 Connecting the Dots … with The RESPECT PRINCIPLE simply is a tool and guide for the growth past Old Covenant religion, plus science as religion and into the spiritual freedom promised in the New Covenant. Still, while we regain our recollection of the spiritual beings we truly are, we need the RESPECT “FULL” peaceful common ground to meet each other upon to resolve our differences or at the very least to find ways to reap the benefits of our differences. The RESPECT PRINCIPLE is science-based because of its logic and practicality, but because of its psychological and emotional component of compassion, it is also more humane, developing us past cause and effect robots who can turn away when we need to turn in. The RESPECT PRINCIPLE helps us change, not in leaps in bounds, but in small steps as we develop into more of what we can become as a species. The great news is with all the small steps we each take, the synergy of all of our efforts translates into huge benefits for us all as we learn to work together better because we know what we do for others, serves us as well too. Then, we will be living the New Covenant, whether we believe in it or not. This is really good news for the world we all have to live in together. Amanda Berry, Gina DeJesus and Michelle Knight may not be your daughter, sister or friend … but they could be. 3 young women enslaved and imprisoned for 10 years by 3 men in a crowded community. Please explain to these daughters, sisters and friends, to their families, to me and to yourself why … why you are not supporting and sponsoring the launch of a global initiative to raise individual and global RESPECT LEVELS so people will value life, theirs and others, enough not to enslave any person in any way. Take the The Rationale Challenge! The life you save will not only be your own, but also your daughters and sons, your sisters and brothers, and your friends because you, we, all have to live in this world … and how we live in this world as individuals creates the world we all have to live in … together. Bangladesh: Connecting the Dots … How Much Money is Enough? This and so much more … generates the mentality and the circumstances we are passing onto the next generations. Without connecting the dots … changing our way of thinking by changing our beliefs and actions … recognizing that we are all losing with our historical and present belief that some people are more valuable than others … there will always be those fighting, lying, cheating, and stealing to keep what they have gained on the backs of others … from those who have not … yet ironically, those who “have” are teaching those who have not how to be just like them … to get what they want at any cost, so why should they be surprised when people, even when not on conscious purpose do the same? When we will all realize how much is enough? When we have raised our RESPECT LEVEL enough to value others as we value ourselves. Anything else is self-destructive since we do all have to share the same planet and its resources.